President Trump spoke to reporters at Palm Beach International Airport on Sunday. 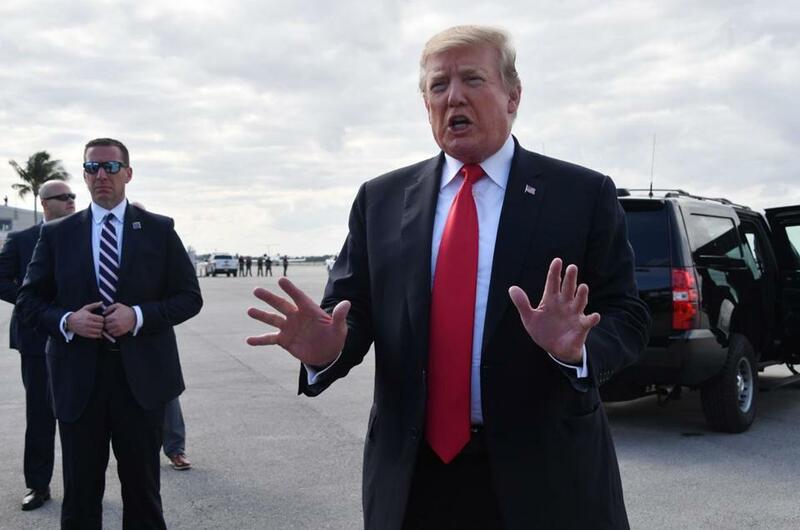 WEST PALM BEACH, Fla. — President Trump celebrated a summary of the special counsel’s investigation Sunday, calling it ‘‘a complete and total exoneration,’’ even though the report did not give a definitive answer on whether he obstructed justice. Trump’s had kept a low profile over the weekend, heeding the advice of his lawyers, who warned him against tweeting about the probe before details were released. But on Sunday night he signaled he was eager to go on the offensive against the probe, which has shadowed his presidency. For their part, Democrats called for Mueller’s full report to be released and vowed to press on with their own investigation, setting up future clashes with the White House. Before the summary was released, Trump was said to be relieved and happy that Mueller’s probe ended without any new indictments , according to people close to the White House. Notably, Trump dialed back his high-octane Twitter account over the weekend. Early Sunday morning, he tweeted: ‘‘Good Morning, Have A Great Day!’’ and ‘‘MAKE AMERICA GREAT AGAIN!’’ The relative silence stood in contrast with the previous weekend, when Trump unleashed more than 50 tweets, many scathing attacks on the investigations that imperiled his presidency. Immediately after the summary was made public, the president’s supporters and aides repeated Trump’s mantra that there was ‘‘no collusion’’ with Russia. Trump spent Sunday golfing with Graham, former Representative Trey Gowdy, a South Carolina Republican, and his acting chief of staff, Mick Mulvaney, also a former South Carolina congressman, according to a White House official, as aides sought to keep the president busy during the tumultuous weekend. The president has railed against Mueller for months, calling the investigation a politically motivated ‘‘witch hunt.’’ The inquiry focused on whether Trump’s campaign coordinated with Russia during the 2016 campaign, as well as whether the president tried to obstruct the probe. A larger pack of aides than normal — including press secretary Sarah Sanders — traveled with Trump to his Mar-a-Lago estate in Palm Beach to manage any fallout. Trump was briefed on what his supporters would say on television throughout the weekend; aides hoped he might stay quiet if he felt his messages were getting out, even if he wasn’t delivering them himself. White House officials were cautious about declaring victory or getting ahead of the details, said a person familiar with White House thinking, who like others insisted on anonymity because they were not authorized to discuss the matter publicly. Trump allies like Republican Representatives Mark Meadows and Jim Jordan handled television interviews over the weekend, while White House officials were expected to speak more during the week. Trump spent the weekend surrounded by aides, friends, and family, including son Donald Trump Jr. and his girlfriend, Kimberly Guilfoyle, who are at the Florida estate for spring break with their children. Trump’s eldest son was out fishing with his children when the report was delivered. The president and first lady Melania Trump celebrated their son Barron’s 13th birthday with dinner on the patio of Mar-a-Lago Friday night. Trump also attended a GOP dinner that night and basked in the applause of hundreds of dressed-to-the-nines attendees. He spent Saturday golfing with singer-songwriter Kid Rock in temperatures that hit the 80s, and headed back to his golf club again on Sunday. Trump also spent time on the phone with confidants. The president’s low-key approach was a marked shift from his posture in previous days. Beginning last weekend, he unleashed a storm of tweets that were unusually harsh and varied, even by Trump’s standards. Aides blamed that Twitter explosion, in part, on too much free time. Heading into the weekend, Trump advisers made a point of keeping the president busy and focused on positive developments, according to a Republican close to the White House.